Born and raised in Wilmington Delaware, Steven earned his degree in Global Studies from the University of California, Los Angeles before joining the Juniata Enrollment team. During his time at UCLA Steven worked for their admissions team as a Bruin Ambassador for 3 years, working heavily with students from Los Angeles, and around the country. Simultaneously he played multiple intramural sports, while participating in service organizations such as Mentorship @ UCLA and Colleges Against Cancer which put on Relay for life. Steven also studied abroad in Paris, France and completed a Senior Thesis which earned him departmental honors. Having driven across the United States twice while in college and visiting 7 different countries growing up, Steven has a passion for traveling and looks to bring that passion to his recruitment efforts in West Virginia, Virginia, Maryland, DC, and Delaware. 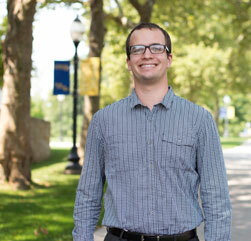 Juniata provides a unique and exciting opportunity for Steven to interact with students and to serve as a resource during the exciting and nerve-wracking college admissions process. In his free time, Steven loves watching baseball, going to country concerts, hiking, and long walks on the beach. If you have any questions for Steven, please don’t hesitate to reach out to him!